I might have gone into this book with too-high expectations. 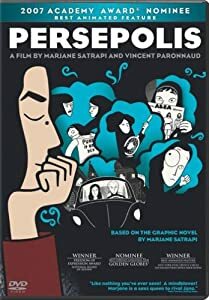 Persepolis has won numerous awards, as has the film adaptation. That being said, I felt a little let down after reading it. Don’t get me wrong, it was a good story and an intriguing look behind the scenes of the Islamic Revolution in Iran as well as general Iranian culture. But Marji herself does not come across as a very sympathetic figure. I loved her ten year-old self in the beginning of the book, but by the middle, she had lost most of what made her so adorable and strong. I will grant that most of us go through the same thing during adolescence, but the fall did seem much more precipitous for Satrapi. Is she redeemed in the end? I won’t say here, but would love to hear other’s thoughts on the subject.